The final volume in the series on new, improved and existing technologies from the Sohn International Symposium addresses topics such as leaching and biotechnology; aqueous processing; preparation and synthesis; and electrochemistry. 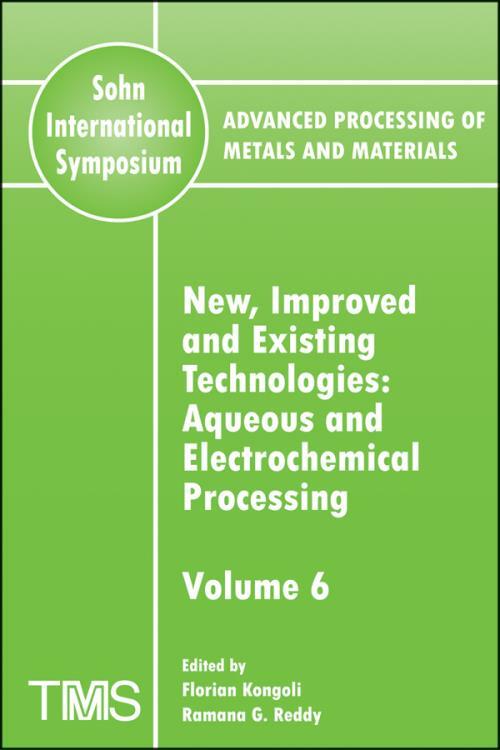 VOLUME 6: NEW, IMPROVED AND EXISTING TECHNOLOGIES: AQUEOUS AND ELECTROCHEMICAL PROCESSING. AQUEOUS PROCESSING I: LEACHING AND BIOTECHNOLOGY. Pressure Leaching of Sulfidized Chalcopyrite in Sulfuric Acid–Oxygen Media (Keynote) (R. Padilla, D. Vega, and M.C. Ruiz). Determination of Acid Resistance of Copper Ore Agglomerates in Heap Leaching (Invited) (K.A. Lewandowski, J.A. Gurtler, T.C. Eisele, and S.K. Kawatra). Novel Technology for Microbial Treatment of Chromium–Containing Slag (L. Chai, and Y. Wang). Hydrometallurgical Approaches for Selecting the Effective Recycle Process of Spent Lithium Ion Battery (J.–S. Sohn, S.–M. Shin, D.–H. Yang, S.–K. Kim, and C.–K. Lee). Pressure Leaching of White Metal as an Alternative to Conversion (Keynote) (M.C. Ruiz, E. Abarz - a, and R. Padilla). Bacteria Leaching Process of the Low–Grade Sulfide Copper Ore (G. Xie, J. Yan, H. Zhang, R. Li, and D. Yang). Mechanical Activation of Monazite Processing by Simultaneous Ball–Milling and Leaching (A.M. Abdel–Rehim). Process for Selenium Recovery from Copper Anode Slime by Alkali Pressure Leaching (S. Saptharishi, D. Mohanty, and B.P. Kamath). On–Line Free Acidity Measurement in Hydrometallurgical Process Solutions Up to 250 °C: A New Industrial Sensor (Invited) (M. Huang, and V.G. Papangelakis). Extraction and Recovery of Indium and Germanium from Primary and Secondary Hydrometallurgical Streams Using Molecular Recognition Technology (N.E. Izatt, J.B. Dale, S.R. Izatt, and R.L. Bruening). Highly Efficient Method of Manufacturing Zinc Bromide (W. Dunaway). New Process for Extracting Cadmium by the System of Ammoniacal–Ammonium Sulfate (W. Liu, J. He, and M.–t. Tang). Optimization of the Critical Steps of the Altair Hydrochloride Pigment Process (D. Verhulst, B. Sabacky, R. Marganski, B. Wang, and D. Ellsworth). Precipitation of Hematite from Ferrous Sulfate Solutions: Effects of Variables on the Quality of the Precipitates (M.C. Ruiz, J. Zapata, and R. Padilla). Precursor Synthesis of Porous Fibrous Cobalt Powder by Coordination Precipitation Process (C.–f. Zhang, C.–y. Dong, J. Zhan, and J.–h. Wu). The Separation of Precious Metals from Base Metals in Gold–Antimony Alloys by Selective Chlorination Leaching Under Controlling Potential (T.–z. Yang, W.–f. Liu, and M.–x. Jiang). Isolation of Mineral Specific Extracellular Protein from Paenibacillus Polymyxa and Its Application in Complex Sulphide Mineral Processing (Abstract Only) (P. Patra). AQUEOUS PROCESSING III: PREPARATION AND SYNTHESIS. Preparation of High Functional Aragonite Precipitated Calcium Carbonate (J.–H. Kim, S.–J. Ko, W.–K. Park, S.–H. Cheong, and J.–W. Ahn). Preparation and Characterization of Ultrafine Magnetite Powder (X.Y. Yang and Z.Q. Gong). Preparation and Structural Characteristic of Cobalt–Modified Magnetite (X. Yang and Z. Gong). Preparation of Mn–Zn Compounds Oxide Powder for Soft Magnetic from Manganese Carbonate Ore and Zinc Oxide Dust (C. Tang, Y. He, M. Tang, and B. Huang). Separation of PET from PVC by Column Flotation (Invited) (E. Agante, I. Rodrigues, and T. Carvalho). Synthesis of L(+)–Calcium Lactate Using Precipitated Calcium Carbonate in Lactic Acid Fermentation (S.–H. Cheong, J.–H. Kim, J.–W. Ahn, and C. Han). Preparation of Monodisperse Rhombohedron–Type Nickel Oxalate Particles from a Highly Condensed Ni(OH)2 Suspension (Z. Liu, Q. Li, K. Ai, D. Zhang, T. Okamoto, and M. Okido). Preparation of Spherical Ultrafine Cobalt Powder by Polyol Reducing (S.–h. Yang, Y.–m. Chen, S.–h. Ju, Z.–q. Pan, and M.–t. Tang). Separation of Pyrite Minerals from Magnetite Slimes by Hydrophobic Flocculation (Abstract Only) (B. Rezai). A New Technology for the Control of Lead Nitrate Addition in Cyanidation (Invited) (G. DeschOnes, M. Fulton, and C. Smith). High–Efficiency Reactors for Obtaining Metal Powders (T. Lezhava, and J. Ghlonti). Elimination of Zinc Ferrite for Hydrometallurgical Recovery of Zinc from EAF Dust (G. Ye, E. Burstrom, M. Maccagni, L. Bianco, and H. Stripple). Recovery of Ga, Ge from Zinc Residues by Hydrometallurgical Processes (H. Wang, J. Lin, K. Jiang, and D. Qiu). Recovery of the Chromium (III, VI) from Aqueous Solutions Using Ion Exchange System (J.C. Riani, V.A. Leão, and J.S. Tenrio). Study on Several Important Hydrometallurgical Methods of Fe Removal from Zn, Mn, Cu, Ni, Co etc. (W. Zhang, and G. Mei). Study on Extracting Indium from Indium–Zinc Concentrates (M.–t. Tang, S.–q. Li, J. He, S.–h. Yang, C.–b. Tang, and S.–h. Ju). Sulfur Dioxide in Hydrometallurgical Technologies for Integrated Processing of Polymetallic Concentrates (A.V. Tarasov, and E.M. Timoshenko). Corrosion Behavior of Lead–Alloy Anodes in Metal Winning (Keynote) (M. Stelter, H. Bombach, and P. Saltykov). Electrochemical Studies of the Intermetallic Inert Anodes in Molten Salts (X. Yang, and A. Jha). Ionic Liquid Electro–Deposition of Reactive Metals (Keynote) (J. Vaughan, J. Tu, and D. Dreisinger). Electrochemical Modeling of Electrowinning Performance (Keynote) (M.L. Free, R. Bhide, A. Rodchanarowan, and N. Phadke). Atmospheric–Pressure Plasma Process and Applications (Invited) (P. Kong). The Effect of Anode Composition on Passivation of Commercial Copper Electrorefining Anodes (Invited) (M.S. Moats, and J.B. Hiskey). Conductivity Measurement of Scandium Doped Barium Zirconate for Fuel Cell Application (S. Imashuku, T. Uda, and Y. Awakura). Development of Zinc Production at the Chelyabinsk Zinc Plant (L.A. Kazanbayev, and P.A. Kozlov). GEOTHERMAL IN MINERAL RECOVERY AND GENERAL MINERALS PROCESSING. Geothermal Mineral Recovery (Keynote) (J.M. Canty, and L. Mink). Economic Benefits of Mineral Extraction from Geothermal Brines (Invited) (R.G. Bloomquist). Co–Production of Silica and Other Commodities from Geothermal Fluids (Invited) (W. Bourcier, C. Bruton, E. Burton, B. Ralph, M. Johnson, and G. Nix). Use of Ceramics for Geothermal and Mining Applications (Invited) (A.C. Mulligan, and M.C.L. Patterson). Geothermal Brines High Value Mineral Extraction (Invited) (M.C.L. Patterson). Research on the Use of Waste Silica from the Cerro Prieto Geothermal Field, Mexico (Invited) (J.W. Lund, and T.L. Boyd). Radar Geosteering in Geothermal Reservoirs or Development of Radar– Controlled Directional Drilling Bottom Assembly for Geothermal Reservoirs (Invited) (L.G. Stolarczyk). Investigation of the Effects of Interstitial Filling Ratios on the Dry Grinding Kinetics of K–Feldspar (H. Ipek). Preliminary Characterization, Liberation, and Dressing of Zircon from Michoacan Beach Sands (R. Escudero, and F.J. Tavera). Characterization of Ilm nite Ore Samples from Dankoli in North Western Nigeria (Abstract Only) (A. Adetunji). The Fabrication of Artificial Marble from Dolomite (Batu Reput) (K. Hussin, J. Shamsul, C.M. Ruzaidi, M.I. Sobri, M.S. Nazry, M.B. Zaman, and K. Nizar).